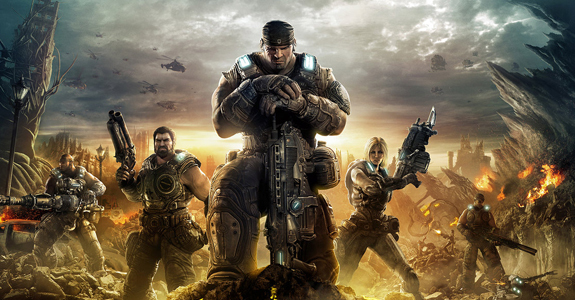 Thus far the Gears franchise... gives me a mixed bag of thoughts on it's quality. The first Gears, I enjoyed going through with a cousin... but the predicable "run from one area of cover and firefights to the next" really grew boring for me and I really felt they should of mixed it up more. Gears 2 comes out and I'm floored at the amount of variety they put into it, it seemed as though I never got bored of the gameplay and it didn't feel like room after room of bad guys hiding behind cover. Jump to Gears 3 and... well, game play wise... I find it stuck between Gears 1 and Gears 2. There are moments of brilliance, especially boss battles, but by the end of the campaign I was attempting to run through the remaining rooms of hunkered down bad guys just so I could continue the story. I did enjoy battling the new and different type of baddies... but the standard grunts that stand upright like humans and fire as such... bored the hell out of me. The game rarely deviates away from these battle rooms and even when they do... you're stuck in a vehicle or something just gunning at stuff - rather than testing your skill driving or escaping or something beyond a rails shoot fest. Again, compared to Gears 2 which seemed to give you something new to do every 10 minutes, I was let down by Gears3's lackluster inclusion of these kind of scenarios. Story wise it's decent as you get a nice mix of new characters as well as more fleshed out returning characters and a touching story. There are a few key moments in the game that'll tug at your heart strings, but IMO they don't match those used in Gears2. The visuals on the other hand are frakking breath-taking! You really need to just stop and look at stuff to enjoy it better. The textures are great and lighting really kicks it up a notch, bringing the scenes into a better light (oh!). The music is decent (as always) and the voice acting good, but neither surprised me. In the end, I played a game that looks superb visually, yet seems to take a step back from the freshness of Gears 2 in favor of taking a look back at the original game and how it did gameplay. I gave it an 8.5 simply because I rated Gears1 an 8.0 and Gears 2 a 9.0, so it's a good middle ground :P. I must also mention that outside of the beta experience, I've not played the multiplayer and don't plan to and as such didn't rate the game based on that aspect. As you may of been able to tell (thanks to a blog post a little while back) Payday surprised me with it's solid core despite it's flaws. The game, while lacking a 'AAA' visual style, still looks rather good for a download title. The controls feel a bit sensitive, even when adjusted, but once you pin them down, it's rather easy to do exactly what you want. 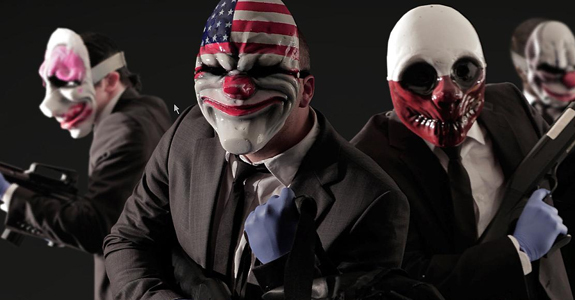 You play one for 4 masked men (odd clown masks at that) whom are, more or less, professional theives who take on jobs of robbing banks, infiltrating diamond strong holds or breaking other criminals out of armored transport vans. Each plays the same, but they all seem to have their own personality and quirks as characters which help you in the immersion of the title. The team could of gone farther with using those unique characters to make them more memorable... but as it stands they're not too bad. Co-op is key, as you work together with 3 others (human or AI) to go about the tasks given to you to complete the job. You can be drilling into a vault, burning a hole through a floor or hacking security computers all the while strategically trying to control hostages, fight off the police (and later their more difficult special forces) and make sure the rest of your team isn't killed or captured. The interesting part is that you get a set amount of health at the first and while your perks help out with better armor and (for some classes) a 1 time use med pack; you're more or less dependent on trying not to get shot and relying on team mates to help you up if you've fallen due to low health. Without working together, it's easy to be overcome by the law enforcers as you're often left to defend in areas without much cover and the cops storm you in relentless waves. Ammo too is limited (again you can get a perk in one class that allows a drop of an ammo bag) and you must pick up the ammo from downed cops; you can't take their weapons, as your load-out is based on a menu you choose before the heist, which really only adds to the strategy. All of your weapons, health limit, body armor and other helping tools are contained in these perks (some are constants, like body armor level or gun power increases, others like weapons and bags of ammo or medical supplies are equipped in limited slots). The idea and execution are tight and equals a lot of fun. Like mentioned, it's not the prettiest game and the sound is adequate, it's got touchy controls and there could of been more flavor put into it's style, but over all the game play outshines the shortcomings to give you a unique and memorable experience that keeps you coming back. 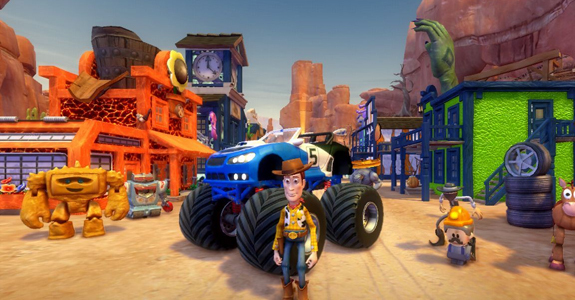 I wasn't expecting much out of Toy Story 3... being a kid friendly game and a movie tie in at that... I expected to jump in, play around for a bit (I had heard the Toy Box mode was fun) and I actually got sucked in for about 15 hours of enjoyment. First out, the game is better in co-op with a friend than it is by yourself. Co-op is jump in/out, so it's not hard to join and the screen splits vertically, giving you a full view for each character to do as you please. My sis and I ripped through the "story mode" in one sitting and it's your typical run through the movie's story, loosely told with key areas presented. In the single player you can collect items to use in the Toy Box mode, which is where the girth of gameplay actually is. This Toy Box mode is a rather large map made up of about 9 different areas, all based on parts of the movies and the characters that inspire them. The first is a town in a desert which is connected to woody and the old west, others like a Zerg tower, Sids haunted house and lotso's magical zen garden place are all unique and offer different types of things to do. Your goal in these areas is to collect stuff for your town, building it up as you go. You unlock horses for riding and racing, cars for the same use, new shops for customizing your town and it's citizens and a huge plethora of tasks. You're asked to find items, race take specific pictures with a camera and even play dodge ball and kick townsfolk through makeshift football goal posts. It's crazy, unique and a hell of a lot of fun for quite some time. Once you've collected enough coins and have unlocked all of the buildings, interactive objects, weapons and what have you, it starts to get a little tedious to play. You have and endless supply of little tasks that the towns folk give you and there is a mammoth amount of stuff to collect both in Toy box and story modes... but at that point there really isn't much need to do so outside of your lust for completion or trophies/achievements. Presentation wise, it's top notch - adopting a style not too different from the movies and everything is voiced, music plays in the background, there's no large glitches to speak of... it just works as intended. It's easy to control, you've got visual queues to tell you what to do and for a good 8+ hours you'll be enjoying going about the tasks of the world. Sadly when you've reached the limit... you've reached your limit and it's best just to move on to a new title :P.
It's been a while since I've played a game this bad. Visually it's a mixed bag... as I thought the weapon models were decent and some of the texture work okay... but the character models are bad even for PS2 era graphics (of which this game is not). The voice over is HORRENDOUS! The music is equally just garbage. Ugh, the A.I doesn't even look at you while shooting, cant' figure out how to move around a car and is more or less cannon fodder for the hour and a half that this game lasts. Yep. I spent 1 hours 40 minutes in this sucker and... that was while goofing around... if you ran through it, it'd last even less. 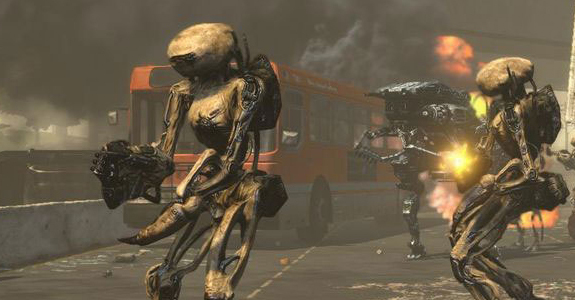 The cut scenes are badly drawn 2D images accompanied by the horrible voice acting and a story that more or less has a group of militia make their way through a city after being attacked by aliens. The aiming... works... but it doesn't matter as the game is brain dead. The controls are limited and in my case, playing the game on my PC - for some reason, even though I was playing with a keyboard/mouse it would send rumble feedback to my connected 360 controller... without any option to turn that off. I've had more fun playing Half-life 1 mods from 1999 which were done in 15 minutes. This game is pure garbage the likes of which you should NEVER buy for any reason. Even if the movie of which this game shares a name was your favorite title ever, avoid this POS.